Raubsville is situated in the eastern part of the township on the Delaware River. It was named for the family of Raubs, who were the first settlers in that vicinity. The first tavern was built there in 1805 by one of that same family. 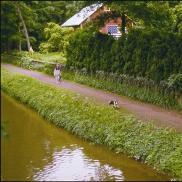 The LC&N made many improvements to the Delaware Canal at Raubsville to help it operate more efficiently. The LC&N rebuilt and widened several locks and, during the course of all this work, Locks No. 22 and 23 were impressively consolidated into the present Ground Hog Lock. This lock, with a lift height of 17.3 feet was the highest along the entire canal.